This post is about two of Mark Knopfler’s Fender vintage amps, the brown Fender Vibrolux – the Sultans of Swing amp that was covered in this blog article – and the similar-sized and similar-looking brown Fender Vibroverb. The Fender Vibrolux (model 6G11a) was one of Knopfler’s earliest guitar amps. Probably it belonged to Dire Straits’ bass player John Illsley and was used for the first demo recordings of Dire Straits, and also for the first record and for their live gigs of this time (late 1977 – early 1978). He still owns this amp and used it regularly on the last albums. 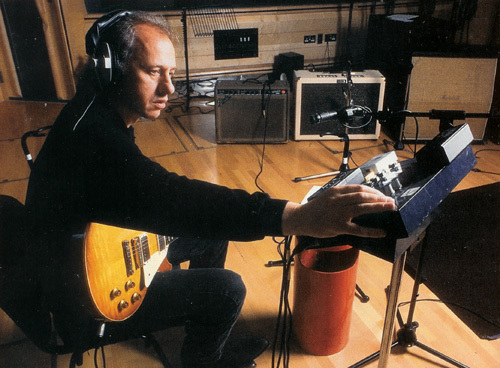 The brown Vibroverb (model 6G16) was a much later addition to Knopfler’s amp arsenal. From what I heard he got it probably in the late 1990ies with some help of John Suhr, and used it e.g. on some Notting Hillbillies gigs of that time. 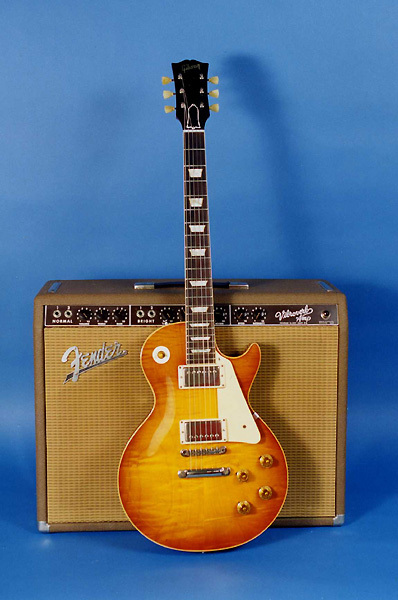 Both amps were only produced for a very short time: the brown Vibrolux from 1961 – 62, and the brown Vibroverb in 1963 only. Consequently, both are ultra rare. The Vibroverb was reissued in the early 1990ies (1990 – 95). Both amps have a lot in common: two channels with a similar pre-amp layout (same tone controls, same pre-amp circuit), about 30 watts from two 6L6 tubes, tremolo, and of course the same design like as all amps from the brown tolex era (wheat cover grill, brown barrel knobs, brown tolex etc.). Note that both – like all brown face amps – don’t feature bright switches. Nevertheless, the little capacitor to boost treble that is normally added with the bright switch is still present on the right channel of both amps, so imagine these amps as bright switch off for the left channel and bright switch on for the right channel. The major differences are the speaker configuration – one 12″ Oxford speaker in the Vibrolux but two 10″ Oxford speakers in the Vibroverb – and the reverb which was only featured in the Vibroverb. 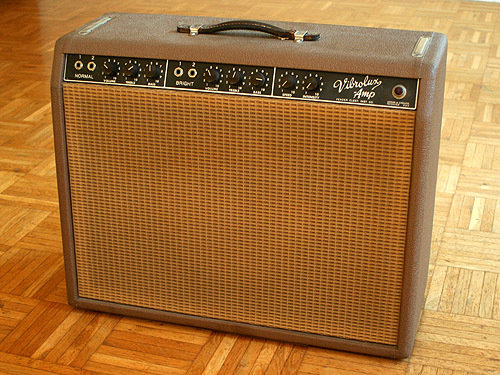 In fact, the Vibroverb was the first Fender amp with reverb, and the only one of the brown tolex era. The Fender spring reverb was available with the brown tolex reverb unit and was later – to be concrete with the introduction of the black face design – added to most of the Fender guitar amplifiers. This combination of features – two 10″ speakers with reverb and tremolo in a middle -sized tube amp – turned the Vibroverb to one of the all-time favourites for many players. Normally it is easy to distinguish both amps on pictures because only the Vibroverb had the grill-mounted Fender logo, while the Vibrolux and other small Fender amps had no grill logo. 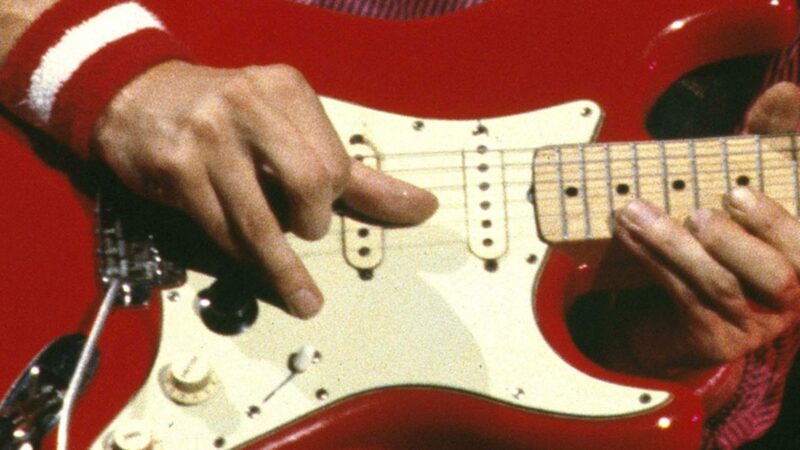 However, Knopfler’s Vibrolux has a non-original Fender logo that was apparently added later (the logo itself looks like the ones from the black or silver face era). Normally there is a special piece of wood for the logo screws, but not so on the Vibrolux. For this reason, the logo on Knopfler’s amp had to be moved extremely into the upper left corner of the grill so that the logo screws hit the wooden frame of the grill front. Other optical differences: only the Vibroverb has those tilt legs on the sides, and the Vibroverb has one additional control – the reverb control on the second channel – so that is has a total of 9 controls (vol, treble, bass / vol, treble, bass, reverb / speed, intensity). This and the two 10″ speakers are the reasonwhy the Vibroverb is a bit wider than the Vibrolux. The Fender Vibrolux in the studio in the mid 90ies. This picture shows why the (non-original) Fender logo has to be located in the extreme upper left corner of the front grill which makes it easy to identify this amp even on low quality pictures. 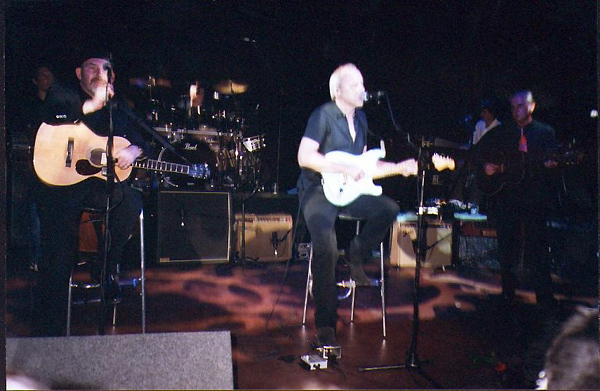 Both Mark Knopfler and Steve Phillips play a brown Vibroverb on stage on this charity gig in 2002. A brown Fender Vibroverb. This amp was produced in 1963 only. The amp in the background on this video clip from is the brown Vibrolux, as the position of the logo tells. Strange guitar sound on the Werchter 1981 recording – Did Mark mix direct out and microphone? The strummed chords in that video are the warmest, most beautiful sounds…. I love it. Ingo, which one works better for the vibrolux Mark’s tone the 12K5 or the 12L6? I can’t remember well the 12K5’s tone compare to the other..
From what I know Mark’s Vibrolux does not have the original speaker anymore, and I suspect that it wasn’t original on that early Dire Straits stuff either. I think originally they came with Oxford 12L6 or 12M6 but I cannot say what the difference in sounds between those models is. have you tried the Kemper profiling amp yet? There is a commercial 3rd party profile of a brownface Vibrolux available that absolutely nails the sound of Mark’s Vibrolux better than anything I’ve ever heard other than the real thing. And that includes any reissue Fender has done in the last 30 years. I believe what you say, Rainer!